Hi everyone - and happy Monday! It's been awhile since I've been here, and it feels good to be back! 1. We're back from South America! We had the most amazing trip. I missed my baby like crazy, but somehow managed to survive the 11 days away from him. He had an awesome time with his grandparents and they LOVED being able to spend some time with him. Pictures and recaps coming in multiple parts soon! 2. I got a new job! Another post will come with more detail, but I am happy to report I accepted a new position on Friday! Leaving my current role is bittersweet, but I know it's ultimately the right move. I start mid-October! 3. My birthday is next week! One week from today, to be exact. I'll be 32 (gulp. So old!) If anyone wants to buy me a present, I'd like this necklace from Stella & Dot. 4. 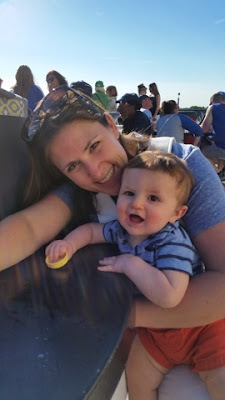 I've got several posts in the queue for coming weeks, like Liam's 9 month update, some pictures from our trip, a few good parenting posts, how I got published on Huffington Post, plus a letter to all the haters from my last blog that was published on HP. 5. I'm ready for fall! I don't think we got much of a summer, but I'm ready for the cooler temps, changing leaves, boots, sweaters, tailgates, football weekends and fires! 6. I had a great weekend! OK, I know I said five things, but here's a sixth. You're welcome. We spent the weekend doing pretty much nothing and it was perfect! 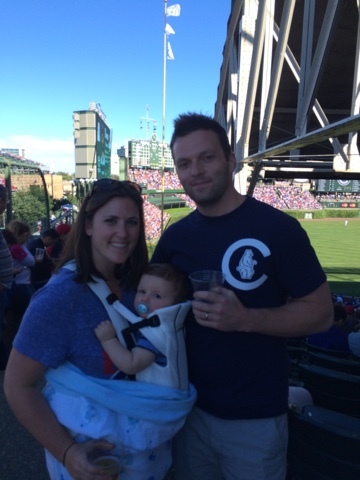 After being gone, we played at home, went on walks, grabbed some meals al fresco and went to a Cubs game! So much fun with my boys. See you tomorrow with Liam's 9 month update!